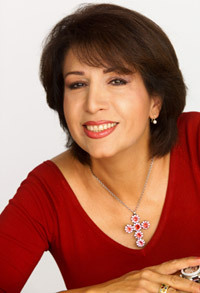 Natela Nicoli Chkoniawas born in Georgia into a reputed family of singers. She completed her studies in piano and voice with distinction and perfected her talent with Renata Scotto, KS Christa Ludwig. After her debut at the Bolshoi Theatre in Moscow, Natela Nicoli Chkonia moved to Austria, where she has been living since 1991. She was for several years a permanent member of the Graz Opera, where she performed important roles such as Octavian, Carmen, Cenerentola, Rosina, Brangдne in "Tristan und Isolde", Meg Page in "Falstaff", Dorabella in "Le Nozze di Figaro", and Maddalena in "Rigoletto". For her outstanding interpretation of Bizet's Carmen, Ms. Nicoli received the Opera Award in Germany in 1994. In 1996 she was offered Austrian citizenship due to her extraordinary artistic contributions to society. Ms.Natela Nicoli Chkonia was invited to sing at the most extinguished theatres and opera houses worldwide, appearing several times at the Salzburg Festival under the direction of Ivor Bolton and Christoph von Dohnanyi. 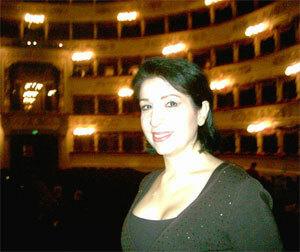 She has produced a CD "ADAGIO" with Edita Gruberova in Munich (Philharmonie im Gasteig) with the Bavarian Radio Orchestra, followed by performances at the Vienna Musikverein, Teatro Comunale di Firenze conducted by Fabio Luisi, Vienna Konzerthaus under the direction of Vladimir Ashkenazy, Vienna Volksoper, and Deutsche Oper Berlin. In 2005 Ms. Natela Nicoli Chkonia toured Germany with Verdi’s Requiem under the direction of Fabio Luisi and travelled to Ljubliana and St Pцlten for the world premiere of J. Offenbach’s romantic opera “Die Rheinnixen” in the role of Hedwig. Natela Nicoli Chkonia has sung under the direction of renowned conductors such as Fabio Luisi, Denis Russel Davis, Ivor Bolton, Christoph von Dohnanyi, Vladimir Ashkenazy, Philippe Jordan, Dimitrij Kitajenko, Jury Bashmet, Sylvain Cambreling, Martin Haselbock, Michail Jurowski, Milan Horvat, Ernst Marzendorfer, Emil Tabakov and Thomas Herzog. April 2007, Concerts under the direction of Fabio Luisi in Weimar and Leipzig.